Lets talk about NAS, dear readers. “What the heck is that?” you may be asking yourself, but don’t worry, that’s what we’re here for! It stands for Network Attached Storage. NAS is the term generally used for an enclosure that contains one or more hard drives which is connected to a network and can be accessed by multiple computers on that network. Compared to a traditional file server, NAS devices typically provide faster read/write speed and a more simple setup and configuration. The nice thing about an NAS is that you can set the hard drives up in a RAID configuration, which in the simplest of terms, allows multiple hard drives to be used as just one drive. We don’t want to get too complicated here, since this is mainly a site for the layman, but if you want to find out more about NAS, check out the Wikipedia page. 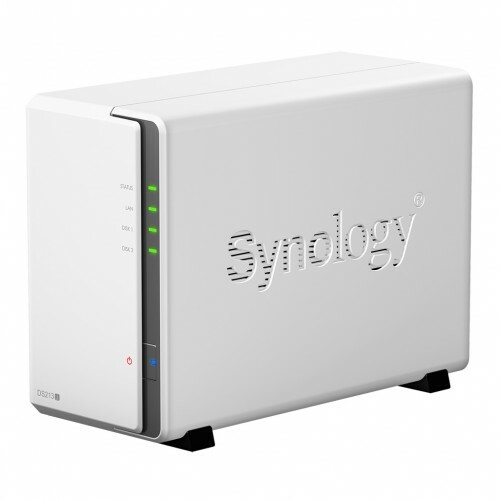 Synology’s DS213j is marketed as an introductory level, budget-friendly NAS unit for small offices and home use due to it’s relatively low storage capacity and the wallet-friendly price. This is not to say that the DS213j does not perform well, as I’ll discuss in a little while. The unit boasts two hard drive bays that can take up to 4 terabytes each for a total of 8 terabytes. The CPU inside the DS213j runs at 1.2GHz and uses 512MB of DDR3 memory. 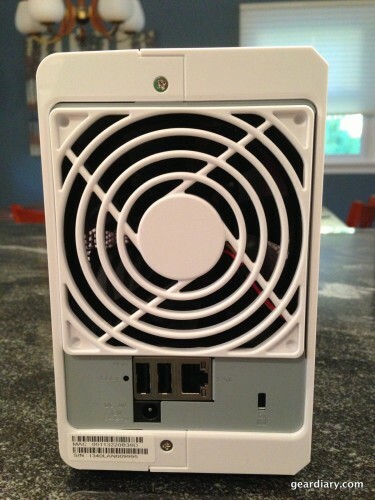 The back of the unit has a LAN port, power port, two USB2 ports, and a fan. All Synology DiskStations run DSM (DiskStation Manager), the operating system that’s used to configure and customize your NAS unit. The rear of the DS213j unit. As soon as I opened up the packaging, I was instantly impressed with how simple the “quick setup” instructions looked. I thought to myself “HA! Nothing is ever that easy!” Boy, was I wrong. Setting up and installing the NAS was as easy as plugging in the Ethernet cable, power cord, and pressing the power button. 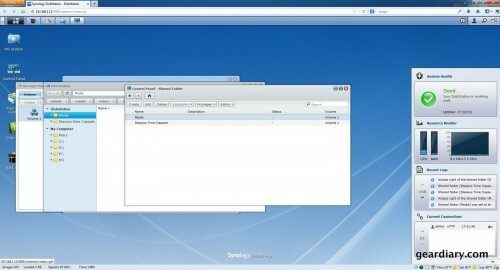 Next, I opened by browser and navigated to http://find.synology.com and BAM, I was able to set up and connect to my new NAS. Easy as pie. The DS213j comes with the main unit, an installation disc, a quick setup guide, an assembly kit, AC power adapter, AC power cord, and a LAN cable. All contents that come in the DS213j package. The DS213j with the cover removed. While it’s running, the DS213j is almost silent, which is great for home office or multimedia use. Synology’s newest budget-conscious NAS unit is a perfect place to keep all of your multimedia, photos, important documents, etc. The DS213j’s 8TB capacity is well sized for the home office or home media center. The 1.2GHz CPU and 512MB RAM provide great speed while navigating the DSM operating system, so you’ll never be left waiting for your NAS to respond. The front of the DS213j. I have been extremely impressed while using DSM so far, as it’s very easy to use if you’ve ever used any operating system before. There are a ton of customization options including apps that can be downloaded from Synology’s Package Center (like the iTunes App Store), like iTunes music servers and antivirus programs. The iTunes music server was so easy to set up, all I had to do was install the app, point it to where my music is saved, name the server, and voila, my music was instantly shared throughout my home network. The DS213j can also be used as a Time Capsule with which to back up your mac computers. As soon as I created a folder entitled “Stacey’s Time Capsule” my fiance’s computer recognized the folder as a place where the Time Machine on her Macbook could backup her computer over our wireless network. Another useful utility that can be installed from Synology’s Package Center is Video Center which collects and archives your TV Shows and Movies and automatically downloads all of the media information like cast list, description, etc. Then, you can access your Movies and TV Shows via your iPhone, iPad, tablet, etc. via Synology’s DS Video app and stream them wirelessly. Easy, like everything else with the DS213j. 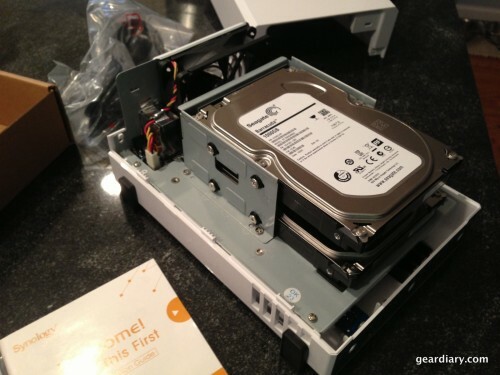 There are way too many ways to use your DiskStation for me to mention in this review. 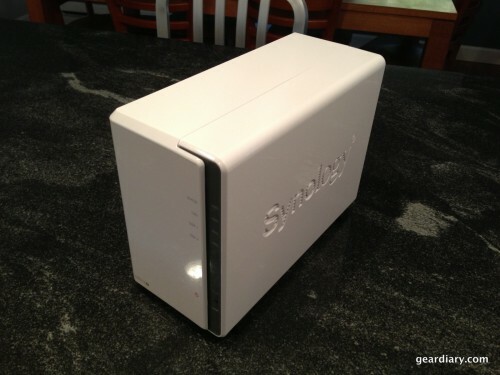 To see all that the DS213j can do, check out Synology’s DSM page. As I mentioned in the Hardware section of this review, it’s extremely easy to create new RAID volumes on your DiskStation with DSM’s Storage Manager. That seems to be a recurring theme in my experience with my DS213j and DSM: ease of use and operation. You’re able to explore the files stored in your DiskStation pretty easily with DSM’s File Station app. 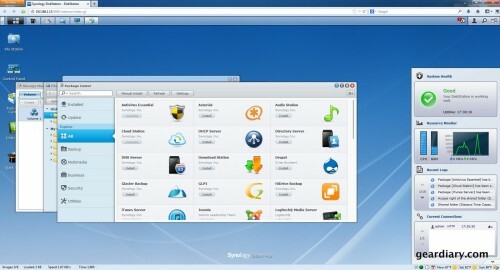 Synology’s Package Center, where you can find, download, and install new apps and utilities for your DiskStation. Synology boasts that the DS213j can reach read speeds of 100MB/s and write speeds of 70MB/s under ideal network settings. Unfortunately, my network setup is far from ideal, with a 10/10/100 Verizon FIOS wired/wireless router, so I will not give a detailed speed report. 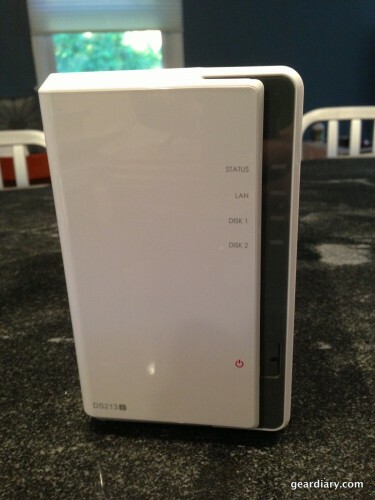 When I first tried using the DS213j through the FIOS router, I was only getting read speeds around 11MB/s. In order to increase speeds, I installed a gigabit switch so that I could connect the DiskStation directly to my PC without getting bottlenecked at the router. After installing the gigabit switch, I reached write speeds around 70MB/s, which was a vast improvement. I have been able to stream 1080p videos from the DiskStation to my PC flawlessly, without any hiccups. That says a lot about the performance of my DS213j and that is exactly what I’ll be using the NAS for most of the time. The bottom line on the DS213j is this: I absolutely love it. There are very few negatives when it comes to this NAS unit and it performs admirably for a budget-friendly device. The DS213j performs well in every function that I need it for in a home multimedia environment. The only thing I would wish for in this unit is hot-swappable hard drive bays so that I can install and uninstall hard drives without a screwdriver and screws. 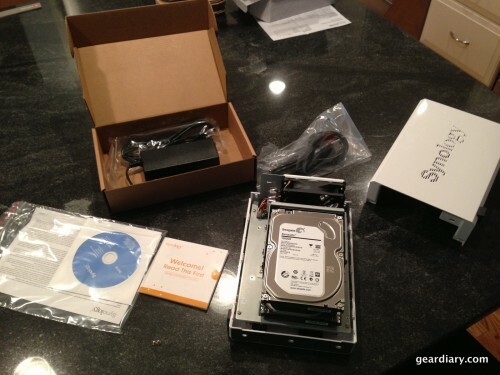 You can buy the Synology DiskStation DS213j from Amazon, here. What I Like: Extremely simple setup and use; DSM works well to use and configure the NAS; read/write speed is great; Apps are a nice touch and access from the cloud is fantastic; Almost silent. What Needs Improvement: The NAS takes a little while to start up; Hot-swappable hard drive bays would be a great addition.